A straighter smile isn’t only important for looking better, it makes a difference in how you feel and how your teeth work too. It can even make a difference in how long your teeth last! That’s why we offer Invisalign® clear braces. Crooked, misaligned teeth can not only affect your looks but also your health and comfort. Misaligned teeth can cause headaches and jaw pain, and when teeth are crooked, plaque build-up can increase, leading to gum disease. An improper bite also means you can’t chew food properly, which can sometimes lead to gastrointestinal problems or nutritional deficiency. If the thought of wearing braces is holding you back from the smile you have always dreamed of, Invisalign® braces may be perfect for you! Invisalign® straightens your teeth, without using ugly metal brackets and wires. Instead of those unsightly wires and brackets, we use a series of clear, custom-fitting, removable devices called aligners. Not only are Invisalign® aligners more comfortable and attractive, they also allow you to clean your teeth more effectively than with traditional braces, AND they move your teeth in a much gentler, safer fashion. Our expertise in complex bite problems allows us to get far superior results in all our work, but especially with Invisalign®! 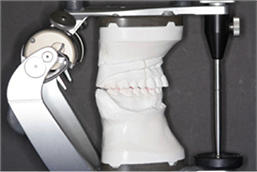 In addition to using precise models of the mouth mounted on 3-D jaw movement simulators, we will also use 3-D computer technology to create custom clear dental aligners that fit around your teeth without braces. You will wear each set of aligners for about two weeks, removing them only to eat, drink, brush and floss. As you replace each aligner with the next in the series, your teeth will move gradually each week until they move into the final prescribed alignment. Total treatment time averages 9 to 15 months, and the average number of aligners worn is between 18 and 30, but this varies by case. Toward the end of the treatment, we will re-evaluate the progress and take specialized steps, unique to our expertise, to make sure we get superior results that require minimal use of retainers and still hold your teeth very stable. Once the treatment is finished you’ll be smiling with confidence!